The 2018 BCEG was hosted by Quw’utsun (Cowichan) Tribes at the Island Saving Centre facilities in downtown Duncan. The three-day event started July 10 with a procession of elders who marched, nation-by-nation, into the arena, drumming, singing and smiling with joy. Once inside, they were seated and welcomed by the host nation. The BCEG is an event that allows First Nations elders throughout the province to come together and connect with one another while sharing culture, language and fun times. In a time when Indigenous languages are fading, the BCEG provides a rare opportunity for fluent elders to get together and speak to one another in languages that they love. This year the hosting nation selected the theme ‘I tst ‘o’ hwun’ ‘I (We are still here). The theme not only speaks to the detrimental effects that residential schools and laws, like the banning of potlatches, had on First Nations language and culture, but it also speaks to the resiliency of the people. AFN National Chief Perry Bellegarde was one of the dignitaries that welcomed the elders at the opening ceremonies. He thanked them for maintaining Aboriginal peoples’ right to self-determination. “The drum is something we all share; it represents unity and it is unity that keeps us strong,” he said. “Today we will celebrate that we are still here, not because of some (government-sanctioned anniversary) birthday of an event, but in spite of it, we are still here!” Bellegarde added. On stage to greet the elders’ procession were dignitaries that included Quw’utsun elected Chief William ‘Chip’ Seymour, the BC Elder’s Gathering King and Queen Ed and Juanita Elliott, B.C. Premier John Horgan, Assembly of First Nations National Chief Perry Bellegarde, MLA Scott Fraser and many more. Emcee JJ Allen told the people that the word Quw’utsun (Cowichan) means to warm your back to the sun. The valley is aptly named and the elders were told there were plenty of water stations, rest areas and volunteers to assist them, if necessary, in the sweltering heat of the Cowichan summer. Chief William ‘Chip’ Seymour welcomed the elders, thanking them for coming to the land of the Quw’utsun people. He talked about an opera that was produced in the 1950s that was based on Cowichan stories and songs. According to Seymour, the opera was performed all over the world during that time. The opera, he said was revived and now a new generation of Quw’utsun people are learning their stories and dances. From that opera are two dances that were performed at the opening ceremonies of the BCEG. British Columbia Premier John Horgan also welcomed the elders, saying this was his third gathering to attend. He said that he is working with his colleague, BC MLA Scott Fraser, Minister of Indigenous Relations and Reconciliation, to help bring about better relations with First Nations. He acknowledged that it was through events like the BCEG that culture and language are revived and preserved. 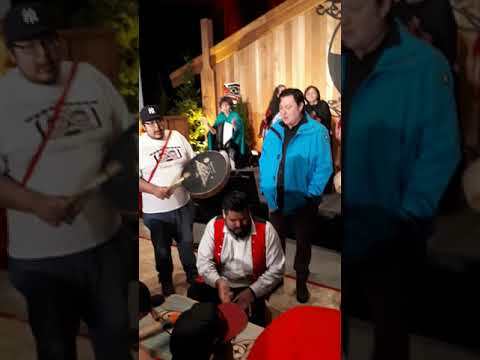 “I hope we will be seeing the young ones taking up the culture and carrying it forward,” said the premier, before announcing that his government has dedicated $50 million to protect Indigenous languages in the province. He said he is pleased to welcome the elders to his neighborhood of Vancouver Island on behalf of all British Columbians. MLA Scott Fraser talked about the importance of preserving Indigenous languages, because, he said British Columbia represents more than half of the Indigenous languages in the country. “The holders of the languages are very low for fluent languages so we don’t have any time to waste (in saving languages),” he said. According to organizers, more than 3,000 elders registered for the event with hundreds more signing up over the three days. An estimated 5,000 people attended including hosts, dignitaries and an amazing team of volunteers. The main gathering place for meals, presentations, shows and dances was in the Island Savings Centre Arena. There were nearby areas set aside for rest, self-care and for vendors selling art, crafts and novelties. Shuttle buses carried people from the venue to scheduled events like boat tours of the bay, territory or the ever-popular bingo at the Cowichan Chances Casino. The elders were treated to a Virtual Elvis (Scott McDonald from Victoria, BC) show on the first night, featuring an Elvis impersonator who had the ladies dancing like it was the ‘50s. The following night the elders danced to tunes from the ‘50s and ‘60s at their sock-hop. Dress in period costume was optional. All of the food was catered and served by volunteers. There was a seafood feast offered from a tent on the second day while a pulled pork sandwich lunch was served in the arena to those with more land-based tastes. The seafood was served outdoors to protect those with seafood allergies. It included crab, clams, mussels and all kinds of smoked and candied salmon. The Elder’s Conference is supported by admission fees that each of the elders are required to pay. But it is a nominal amount and the event could not happen without the support of generous sponsors. Cowichan Tribes thanks their sponsors, which include the The First Nations Health Authority and Chances Casino – Cowichan, and Cowichan Tribes. Dozens of other organizations, institutions, First Nations and local businesses also made contributions. The next B.C. Elder’s Gathering will be hosted by the Lake Babine Nation at Prince George in central British Columbia. The event will take place July 9 – 11, 2019. Elders preregister for the gatherings and many spent the year fundraising to pay their expenses. So, if you see your elders selling raffle tickets or meals, please help them out. Elders from the Ahousaht First Nation approach the Island Savings Centre in Duncan. Premier John Horgan speaks at the gathering during the opening day. Elders from the Mowachaht/Muchalaht First Nation approach the Island Savings Centre in Duncan.